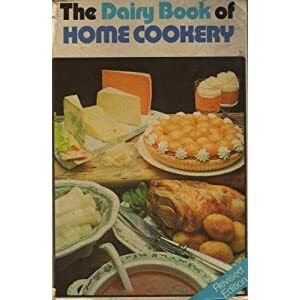 It caught my eye immediately – my Mum has exactly the same edition, and I remembered it well for its comprehensive selection of classic British recipes, and also for the now cringeworthy recipe ideas and photography from the late 1970s! It was published originally by the Milk Marketing Board (a now-defunct UK government agency which regulated the price of milk and promoted the use of dairy products) and consequently contained a lot of rather blatant marketing material. However, the authors included the basic recipe for pretty much every classic British dish, including a huge range of puddings, cakes and home-made confectionery.